August with a little luck brings us the best of the summer weather but being the traditional holiday month it can be hard to keep on top of the vegetable plot with a fortnight away even if a neighbour can be persuaded to water as required. The second early potatoes will all be coming up now, along with early maincrop potatoes and with luck you have escaped the blight. If you do get an attack of potato blight the best method to preserve the crop is to remove the haulm and dispose of it then leave the potatoes in the ground for a fortnight to stop the spores getting onto the tubers. It's best to harvest potatoes fairly early in the day, rinse them off as they come from the ground and then leave in the sunlight for a day to thoroughly dry off and harden the skins before storing. 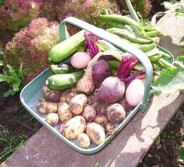 Once you've harvested your potatoes, rather than leave the soil bare to grow weeds through to winter, green manure. Even if it only stops the weeds from growing, it's worthwhile. As spaces develop that you are not going to fill this year, try sowing some dwarf French beans as a green manure. The seeds are cheap enough and even if you have enough beans to feed an army, the plant produces a fair amount of leaf and stem plus the roots, as with all legumes, have nodules containing bacteria that fix nitrogen from the atmosphere. Free fertiliser as well as organic matter can't be bad. Unlike most green manures, French beans can be used in even small patches. There are still quite a few things you should be sowing in August. Spring Cabbage and Chinese cabbage, which is a late crop as well as hardy lettuce. Although we think of lettuce as a summer crop, it is a surprisingly hardy plant and under cloche and in the greenhouse can easily be available for a Boxing day salad rather than some tasteless import from sunnier climes. Sow spring onions like White Lisbon winter hardy which will grow, albeit slowly, to add zing to that salad along with some fast growing radishes. 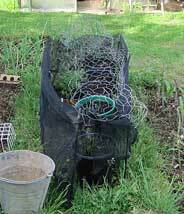 Late spinach can be sown in August along with a last sowing of kohlrabi and turnips. Plant out the savoy cabbages and cauliflowers to grow on for the earliest crop as well as hardy kales. 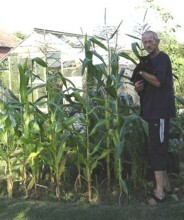 Your runner beans will be at the top of the canes now so pinch out their growing tip to encourage bushier growth below. Pick all runner, climbing and dwarf beans regularly except for the haricot varieties such as Borlotti where we want the bean rather than pod for table. Stop tomato plants now to encourage fruit to swell and ripen. Stopping is the process of cutting off the growing tip so the plant's energy is not diverted into foliage from fruit. Keep your tomato side shoots in check, you want tomatoes not masses of foliage. Keep on top of the pests. Aphids and Blackfly are a particular problem in the greenhouse although they are certainly about in the open plot as well. In the greenhouse the biological controls are most effective and don't forget the traditional sticky yellow cards which attract the whitefly. Keep an eye on your brassicas for butterfly eggs and caterpillars, these will mostly be under the leaves towards the stem in clusters of little yellow/white balls. Pick or wash them off before they develop and dine on your dinner. August is when the Sweet Corn out grows you, hopefully! Protecting the Carrots from Carrot Fly is a must, but look at all the benefits of your hard work!